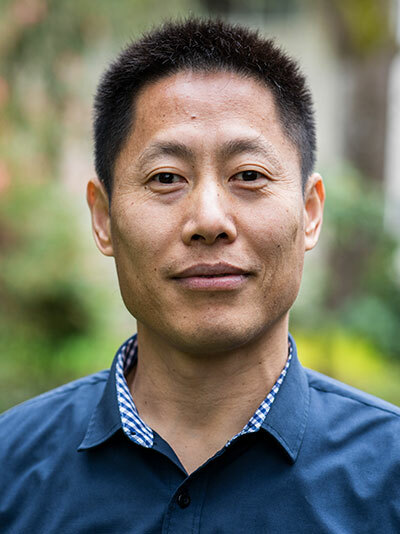 Professor Chengping Zhang joins the College of Business faculty after completing his PhD in finance at Washington State University. His research interests include investments, asset pricing, institutional investors, and behavioral finance. He teaches financial management, corporate finance, investments, financial analysis and modeling, and conceptual foundations of finance in the undergraduate, MBA and DBA programs. In his leisure time, he enjoys playing tennis, badminton, and golf. In addition to involvement and responsibilities in the College of Business and the University, Chengping is an active volunteer for CFA Institute supporting the CFA or CIPM Programs. He serves on the Financial Management Association (FMA) Annual Meeting program committees. He is a reviewer for multiple finance and economics journals, including Financial Review, International Journal of Finance and Economics, Emerging Market Finance and Trade, Journal of Financial Education, Journal of Economics and Finance Education, and Contemporary Economics. He also volunteers for Newberg School District (Book fair, Crater Carnival, End of Year BBQ and other events). “Time-Varying Performance of International Mutual Funds,” with Harry J. Turtle, Journal of Empirical Finance, Vol. 19, No. 3, June 2012, pp. 334-348. “Structural Breaks and Portfolio Performance in Global Equity Markets,” with Harry J. Turtle, Quantitative Finance, Vol. 15, No. 6, June 2015, pp. 909-922. “The Halloween Indicator is More a Treat than a Trick”, with Robert Lloyd and Stevin Rydin, Journal of Accounting and Finance, Vol. 17, No. 6, 2017, pp. 96-108. “Incorporating Powerful Excel Tools into Finance Teaching,” Journal of Financial Education, Vol. 40, No. 3 &amp; 4, Fall/Winter 2014, pp. 87-113. “Using Excel’s Data Table and Chart Tools Effectively in Finance Courses”, Journal of Accounting and Finance, Vol. 15, No. 7, 2015, pp. 79-93. “Helping Students Crack Annuity, Perpetuity, Stock, and Bond Valuation Formulas”, Journal of Economics and Finance Education, Vol. 15, No. 2, Summer 2016, pp. 50-59. Professor Zhang presented multiple times at the Financial Management Association (FMA) Annual Meetings, Financial Education Association (FEA) Annual Conferences, and Academy of Financial Services (AFS) Annual Meetings.